In this age of mega corporations we have been told that size confers advantages and good management is attracted to large companies. Many established, well managed companies have been confronted by what Clayton Christensen calls "disruptive innovations" and he contends that good management and size doesn't always protect them. Originally Clayton who is a Harvard professor did a study on disk drivers noting that a series of innovations had displaced established companies. The displaced companies did almost everything right as far as evaluating the new challenges. They kept in touch with their most important customers to determine what they wanted in the future. They spent money to improve their product lines. Yet new companies using new technologies originally aimed at small niches were able to take over established markets. The most detailed examples are in the disk drive business. The initial disk drive manufacturers provided ever more efficient disks and disk drives for the large mainframe computers. When smaller disks were brought to the market they were considered inefficient and not cost effective, but their size opened up new doors that the large disk manufacturers felt would generate too little profit. As time went by new processes resulted in smaller and smaller disk drives that eventually became more and more efficient. They displaced the established disk makers. Another example was with steam shovels. The goal was to make shovels able to reach further and take in larger amounts of earth. Manufacturers became very efficient at this. A new system using hydraulics instead of steam power and cables at first was not very efficient in terms of reach or load capacity, but found a niche in small jobs where they did have an advantage. Eventually their efficiency improved for the bigger tasks as well and they displaced the established steam shovel manufacturers. Still another example concerned Honda motorcycles. They were used in Japan for local small deliveries and were very much appreciated. The executives had the idea they could be easily adapted for American highways. Unfortunately they were not up to the demands of highway driving and the American manufacturers were not threatened. One of the Japanese staff in America took his Honda motorcycle for a run through some hills in California. One of his neighbors noticed and asked if he could do the same. Eventually they realized they fit in a niche that they helped create--Dirt biking. With this toehold Honda was able to build up its efficiency and really cut into the market share of the established American and European manufacturers. 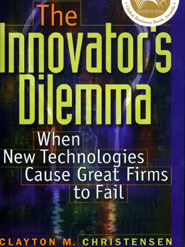 The author repeatedly makes the point that the established business were usually following good business practices when first confronted by disruptive technologies. But they were handicapped without realizing it. Their best customers actually had control of the direction management would follow. The goal was to extend their efficiencies to keep ahead of their established competitors. The thinking from top to bottom was to please their biggest customers. They analyzed profit margins and gravitated towards increasing them and avoiding activities with lower profit margins associated with their new competition. Disruptive products always had difficulties breaking into established markets. They were seen as having lower profit margins and initially as very risky. Those that succeeded did so by finding unmet needs of the market. They became used to failing in their initial attempts. Whereas the big mainframe manufacturers were striving to hold more information in disks, others were interested in cutting the size to fit into smaller containers. The size was sometimes more critical than how much information could be contained. Eventually they increased the efficiencies to compete against bigger machines while gaining the advantages of being more portable and taking up less space. I found the book to be difficult in places because Clayton wanted to document in detail how he arrived at his conclusions which at first glance seem counter intuitive. That meant lots of complicated (for me at least) charts and a lot of history of products long since displaced. Bigger companies seem to have all the advantages over smaller companies. But actually disruptive technologies have great difficulty in being accepted by large companies. Large companies are based on what Clayton terms "sustaining technologies" where the goal is to move forward with incremental improvements. They monitor what their customers want and allocate their resources accordingly. All the staff are geared to do what pleases their customers so the mentality is focused. If someone inside advocates for a disruptive category they are resisted not only in resources, but also in support. To be successful with a disruptive technology it is necessary to take a different attitude. Failure is to be expected and the goal is not to please existing customers, but to find a market. If a large company tries to mix disruptive and sustaining technologies they have to be careful to completely separate the two and make the disruptive part independent realizing they need a sufficient budget to go through at least one failure. Clayton gives useful guidance. Do not attempt to fit a disruptive technology to standards of your existing customers. The first mover principle favours disruptive technologies. The most successful large company adapters completely separate the new disruptive technologies from the established parts of their company. They recognize that the establishment mentality cannot think in the new culture necessary for success.